The freezing of concentrated colloidal suspensions is a complex physical process involving a large number of parameters. These parameters provide unique tools to manipulate the architecture of ice templated materials at multiple length scales in a single processing step. However, we are still far from developing predictive models to describe the growth of ice crystals in concentrated particle slurries. In order to exert reliable control over the microstructural formation of ice templated materials, it is necessary to reach a deeper understanding of the basic relationships between the experimental conditions and the microstructure of the growing solid. We explored the role of several processing variables (e.g., composition of the suspension, freezing rate, and patterning of the freezing surface) that could affect the formulation strategies for the architectural manipulation of ice templated materials. One key objective of current investigations is therefore to gain a robust and predictive control of the porous structure, independently of nature and characteristics of the particles being used. The easiest way to achieve this is to control directly the morphology of the solvent crystals at the crystallographic level. Easier said than done, though! Additives can affect numerous parameters of the system, such as the viscosity, surface tension, pH, freezing temperature, interactions between the particles in suspension, and so forth, all of them having an influence over the crystal growth characteristics. Due to this complexity, the investigations related to the influence of additives have so far been exclusively empirical and the results unpredictable (see above). We’ve been looking for additives that could modify the growth habit planes of the ice crystals at the molecular level. We reported the ice-shaping properties of one zirconium acetate (ZRA) complex, very similar to those of the so-called antifreeze proteins (AFPs). We discovered these properties by accident, while investigating the depletion-induced dispersive properties of ZRA in colloidal suspensions. ZRA is also able to alter the growth morphologies of ice crystals while maintaining their crystal structure. 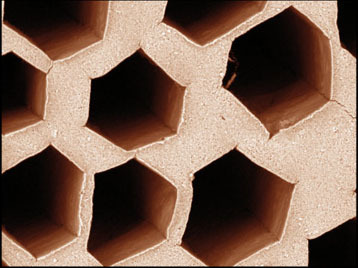 We use this effect to control the morphology of porous materials, an example of which is given below. The results are very robust, almost independent of the nature of the material being used. The ice-shaping mechanism is very similar to that of the usual ice shaping proteins and substitutes known to date. Compounds that can bind and shape ice in biological systems have up to now all been macromolecules – proteins, glycoproteins or polysaccharides. Salts, including acetates, have been reported to enhance the effects of these macromolecules in binding to ice, but have not been reported, so far, to have an ice shaping activity on their own. We are still investigating the underlying mechanism. Any suggestions are welcome ! This work was featured on a few science website, such as ScienceDaily, PhysOrg, ZeitNews and Robaid., and featured in a press release of the CNRS. More recently, we’ve also started to collaborate with the group of Matt Gibson at Warwick University, who develops synthetic antifreeze compounds. We contributed to the characterization of the antifreeze properties of polyproline, using our cryoconfocal microscopy tools. Deville, S. et al. Ice shaping properties, similar to that of antifreeze proteins, of a zirconium acetate complex. PLOS One. 6, e26474 (2011). Deville, S., Viazzi, C. & Guizard, C. Ice-structuring mechanism for zirconium acetate. Langmuir 28, 14892–8 (2012). Marcellini, M., Fernandes, F. M., Dedovets, D. & Deville, S. Water/ice phase transition: The role of zirconium acetate, a compound with ice-shaping properties. J. Chem. Phys. 146, 1–5 (2017). Marcellini, M., Noirjean, C., Dedovets, D., Maria, J. & Deville, S. Time-Lapse, in Situ Imaging of Ice Crystal Growth Using Confocal Microscopy. ACS Omega 1, 1019–1026 (2016).